A leading small satellite company, delivering operational space missions for a range of applications including Earth observation, science, and communications. The company designs, manufactures and operates high-performance satellites and ground systems for a fraction of the price normally associated with space missions. These cost savings are achieved by implementing COTS (commercial off the shelf) satellite technology. This process takes standard consumer technologies, such as those used in personal computers and adapts it to the unique environment of space. Satellite payload testing is critical for several reasons. First, as the hardware is extremely expensive, a lot of testing is expected. Second, if a failure occurs after launch, it is extremely difficult, and likely impossible, to return the entire product for service. 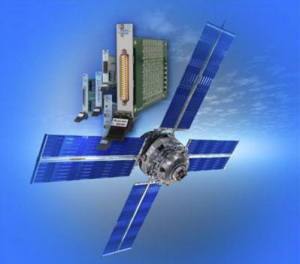 Satellites and payloads are complex systems made up of multiple mixed-technology sub-systems. The traditional approach to satellite development is a very linear fashion; specify everything up front, design to specification, test the prototype, and then assemble and verify the flight unit. This linear approach is obviously very time-consuming and unsuitable for rapid, lower-cost developments, which require more agile methodologies. The designs are developed and progressed far in advance of the main development. This allows very early detection and resolution of inherent design issues, avoiding any costly rework of flight equipment. Interface simulators can be used for system integration testing far in advance to identify and resolve sub-system integration issues. This is especially important on large-scale programs where a single satellite may be made by a dozen different sub-contracted manufacturers. Unlike hardware, the simulator is open, providing a much higher degree of debugging ability. When specifying hardware for this latest simulation requirement, a decision was made by the customer not to base it on heritage tools and strategies. Instead, however, it was decided to take a fresh look at what was available and what was possible, with the goal of choosing an optimally engineered solution within a defined budget. The decision was made to base the hardware primarily upon the PXI standard, with Pickering Interfaces as one of the main suppliers. The reasoning behind this decision came down to one statement from the customer: “The solution fitted our requirement, as opposed to our requirement having to fit the solution”. Ultimately, PXI had the right products at the right price. 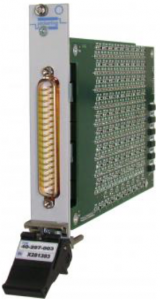 In the case of the Thermal Control System, which monitors key temperatures within the satellite, a key test product in this solution is a high-density PXI precision resistor module (model# 40-297). Six modules were used to simulate thirty-six space-grade thermistors across their full range of -80ºC to +55 ºC. These PXI precision resistor modules were the only commercially available solution that could cover the entire range of the thermistors requiring simulation. In addition to the precision resistor modules, Pickering Interfaces also supplied PXI switch modules for both signal and high power switching, isolated power supply cards, and MIL-STD-1553 bus analyzer modules. The main functions of the switching modules were to isolate interface paths physically, to simulate RF switch feedback contacts and to distribute load channels across multiple paths. One of the key advantages of Pickering Interfaces modules is that they provide complete and physical isolation from the DUT where necessary. A key requirement when connecting into flight-grade equipment, whereby a single-point failure in the test equipment can easily cost over $1.6 Million in flight hardware. The solution serves as a good example of the variation of products that can only be found in PXI and at a low cost.